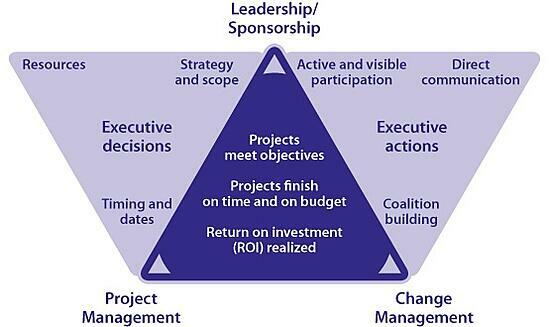 The Prosci PCT™ (Project Change Triangle) Model demonstrates the three elements every project needs to be successful: leadership/sponsorship, project management and change management. 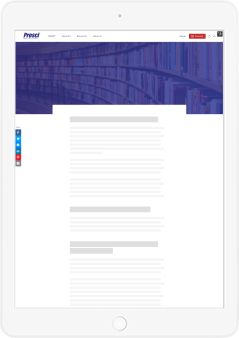 The image below shows the expanded Prosci PCT Model, adding triangles on each side to demonstrate executive responsibilities during a project or initiative. This model provides context to senior leaders about their role and how it relates to both the technical side and the people side of the projects they launch. Through the process of funding, authorizing and chartering a project or initiative, senior leaders establish boundaries and expectations for what will occur and when. In some instances, these decisions are formalized through a process that could include a project charter, a project budget or a statement of work. Whichever the case, senior leaders must provide direction about the change and the impact it will have on the organization. In all of Prosci's benchmarking studies (since 1998), the role of the senior leader in times of change was cited as the greatest overall contributor to success. Additionally, ineffective sponsorship was at the top of the list of greatest obstacles to success. Senior leaders play a critical role in providing the authority and credibility a project or initiative requires for success. The first relates to people and architecting the relationship between those managing the technical side of the change and those managing the people side of the change. 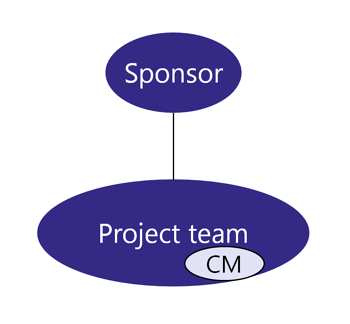 The team structures listed below show options for the relationship between the change management and project management teams. In Prosci's 2013 benchmarking study, participants reported on which structure they used. Over 30% of participants used Team Structure A, where the change management resources were on the project team. 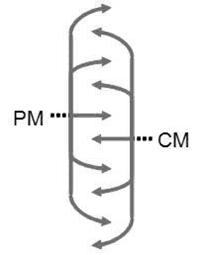 This was also the most commonly used structure in the 2009 study. 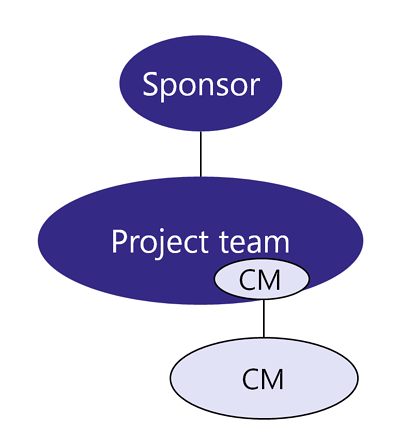 The second most commonly used team structure was Team Structure D, where the project and change management teams were one in the same. There is not one "right" structure; the best structure depends on the nature and size of the change and how the organization operates. Change management resources are on the project team. 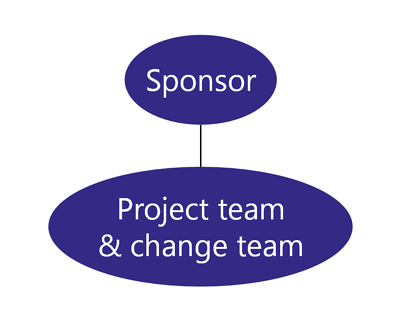 Change management resources are external of but support the project team. Change management resource is on the project team and is supported by an external change management team. Project team and change management resources are one in the same. The second level of connection between project management and change management is related to process - integrating both technical side and people side elements into a single project plan. Change management is not always brought in early in a project lifecycle. In some cases it is brought in late as a damage control mechanism once resistance is already rampant. This is not the preferred approach as change management is most effective when it starts at the initiation of a project. Teams can be more proactive and anticipate and mitigate objections and obstacles, rather than simply reacting to them. 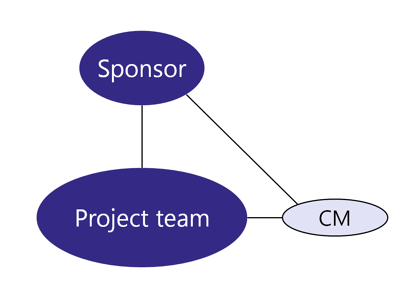 The better the people side and technical side of a project can be integrated (as shown in the illustration above), the more likely a project is to deliver on objectives. To learn more about integrating project management and change management processes, click here. When the three corners are in place, and when the interactions between corners are active, projects are positioned to deliver results, stay on time and on budget and sustain an energized and engaged workforce.